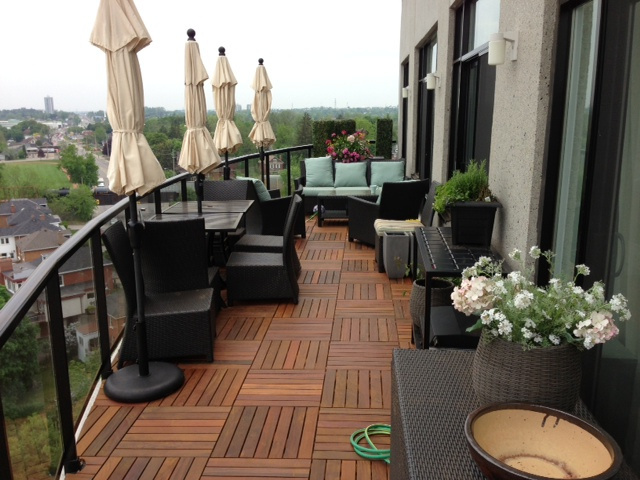 Transforming Outdoor Spaces One Tile At A Time! 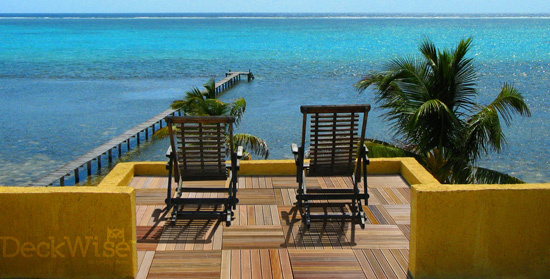 Tropical hardwood tiles are the easiest and quickest way to transform a drab outdoor space into a beautiful hardwood outdoor entertainment area. 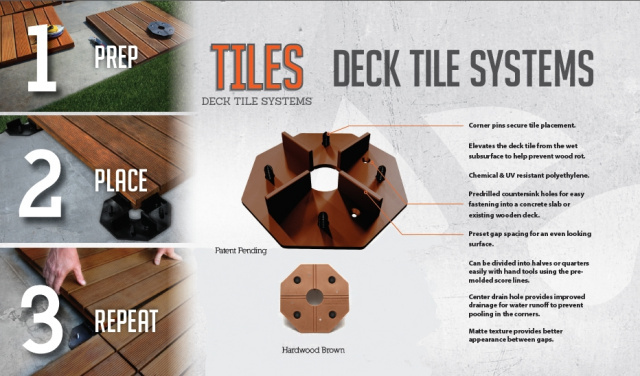 Our tile offering utilizes Deckwise's patented tile connector which nicely secures tiles at even spacing, lift the wood up off of the surface to underneath keeping it away from water and dirt contact, and most importantly it allows for the unimpeded drainage of water in any direction underneath. This is crucial to avoiding the collection of dirt and standing water than can plague installations with plastic base tiles. Our tiles come predrilled with bottom holes to accept the tile connector's connection post. Installation is quicker and easier than plastic bases which require snapping many small connectors into place at just the right position. Connectors have integrated cut lines that allow them to easily be halved or quartered for securing end and corner tiles. The tiles are made from incredibly durable premium Sandeka and ipe hardwood, so they will last a lifetime. They can easily be disassembled and reassembled in a new configuration or at a new location. Please call or email for shipping costs - our shipping rates on tiles are fantastic but the $12.99 flat rate shipping deal does not apply to deck boards or tiles.